Please accept my blessings. I beg to acknowledge receipt of your letter dated 14 February, 1970, along with $15 maintenance costs, and I thank you very much for this. I think Hamsaduta and Himavati are already on their way to Germany. Most probably they will reach Germany directly; if not, they may go via London. Anyway, Hamsaduta's presence in your center along with Himavati will certainly enhance your spiritual activities. Both of them are sincere devotees and senior members. If he agrees, I think he can be made the president because he is the seniormost amongst you. In outside Sankirtana Party he will be a first class asset, and for Deity worship Himavati will be second to none. So try to utilize their service properly and increase the movement more and more in Germany. Germany is a good field for expanding this movement because practically I know the largest number of ``Hare Krishna Mantra'' records have been sold in Germany; and from your report it also appears that their response is very encouraging as you have sold so many BTGs in one day. Regarding your jewelry engagement, you must finish the examination very satisfactorily first. Things which have taken for so long time must be terminated in good result and the same may be offered to Krsna. Krsna is ready to accept service from all directions, and our Krsna Consciousness movement is particularly meant for this purpose. So when you pass your examination, then we shall consider what to do next. I have received the photograph of the Deities and it is very nice. Decorate the throne with as many flowers as possible, and the columns of the throne may be wrapped with flowers and leaves if possible. Lord Caitanya's Appearance day falls on March 22, that is on a Sunday. The devotees should fast until evening, when there is a ceremony and offering of a small amount of Ekadasi preparations. The next day, the devotees should celebrate amongst themselves with a small scale feast. You may hold the celebration open to the public on the following Sunday. The preparation to be offered specially on this occasion is bhuni kichri: Fry equal parts dal and rice in ghee and massala. Add two times water as dal and rice, and add vegetables (if you use more ghee, use less water). Cook it until it is dried and the rice is soft. I am very glad to learn that Michael and Henning are both very sincere boys, and Henning is an expert carpenter. If they go to London to help Syamasundara. with building the Rathayatra car, that will be a great service. Please offer them my blessings; and the more they become enthusiastic in Krsna's service, the more they will feel transcendental bliss and become advanced in Krsna Consciousness. It will be very nice if you can make some jewelries for my Deities--two sets of crowns, necklaces, bangles, and earrings, and a flute for Krsna. The flute should be this size and on the end it should have a head like this, I think you may have seen some picture. Devananda will make some drawings of the other jewelry and send to you. Hope this will meet you in good health. Please offer my blessings to all the boys and girls in our Hamburg center. Please accept my blessings. Since a long time I have not heard from you, but I am glad to learn that you are doing your duties nicely. I always remember your smiling face and submissive attitude. Be blessed by Krsna and be happy. P.S. I think that many of you may go to London to participate in the Rathayatra festival there. That will be very nice. Please accept my blessings. I beg to acknowledge receipt of your letter dated 14 February, 1970, and I am so much glad to note how nicely you are realizing the importance of Krsna Consciousness movement. This is Krsna's grace; so work sincerely and seriously, and thus Krsna from within will reveal everything confidential. Please accept my blessings. I am so glad to receive your letter dated 12 February, 1970, along with your check for $50, and thank you very much for this. Your touring in different places and preaching Krsna Consciousness is fulfilling my dream. May Krsna bless you on and on for being engaged in such exalted work. In the Bhagavad-gita, last portion of eighteenth chapter, it is said that nobody is dearer to Krsna than anybody on the earth except the person who is engaged in preaching the most confidential philosophy of life, namely surrendering unto Krsna, leaving aside everything material or spiritual. In the Vedic literature there are many recommended processes for spiritual realization, and Lord Krsna says that all of them can be avoided and if one is simply engaged in the transcendental loving service of the Lord that is the highest perfectional platform. There is a great future for this Krsna Consciousness movement in every part of the world, and I am getting such indications from every where. So please continue these activities by travelling on your good truck, assisted by some sincere devotees like Yadunandana and others, and I am sure you will be successful in your mission. Now I am hopeful that our New Vrindaban will be an exact replica of Vrindaban in India. I think it was ordained by Krsna that you went there, took your Sannyas order of life in the presence of Rupa Goswami and Jiva Goswami, and now you have got the opportunity to execute their will. Perhaps you may remember that after you accepted the Sannyas order many hundreds of people congratulated you, and you were looking so beautiful at that time that some of them were murmuring that this Sannyasi is looking exactly like Sri Caitanya. So all those utterances are the blessings of Sri Sri Radha Damodara. So carry on this work more enthusiastically and you will feel more and more jubilant in transcendental bliss. So far I am concerned, because our relationship is father and son, so nobody will be more satisfied than me by seeing your successful preaching work. Nobody in this world likes to be defeated by somebody else, but the father when he is defeated by the son feels more pleasure. Therefore, I may once more request you to try your best to construct New Vrindaban an exact duplicate of Vrindaban, and that will give me the highest pleasure. Side by side, please try to introduce our books in the different university curricula, and that will be another success. I have information from Gargamuni that major portions of my TLC are not yet sold. Of course such literatures are not meant for ordinary public, but I am sure if you try to introduce in the university circle; and I have got many testimonials of my books and thus they can be introduced without any difficulty. By the by, I may inform you that you desire me to go to New Vrindaban during Janmastami days, and I suggested to organize a fair within our campus. Do you think it is possible to do so within such short period? But if you can do so, either this year or next, I am sure many people will come to see such fair, and that will be a great impetus for developing the land. The most important thing is easy transport. P.S. Our Isopanisad is now published. Please accept my blessings. I am very much pleased to read your letter dated 13 February, 1970, and thank you very much for your appreciation. Now I see that in our society the girls are more intelligent than the boys. The way of discussion with Dr. Staal requires a little bit of knowledge in the sastras which is called siddhanta. In the Caitanya Caritamrta it is said that nobody should be neglectful of the siddhanta because by siddhantic conclusion one becomes firm in Krsna Consciousness. So these siddhantic conclusions are being mentioned in all my books, and the boys and girls in our Krsna Society should now give more attention for studying the books very attentively. And to get the strength, one should chant the beads sixteen rounds without fail. In this way, when the devotee is constantly engaged in Krsna Consciousness, at that time, Krsna will give all intelligence from within how to make steady progress in Krsna Consciousness. I hope in Washington center you will ask all the boys and girls to follow this method, because henceforward we will have to face many scholars and philosophers to stabilize our Krsna Consciousness movement. I have received the Uher tape recorder, and Devananda will try to use the machine according to Dinesh's instructions. Please convey my blessings to all the boys and girls in Washington Temple. Hope this will meet you in good health. Please accept my blessings. I beg to acknowledge receipt of your letter dated 3 February, 1970, and I have also received the copy of the article printed in the Japan Times Weekly. I am so glad to learn of your successful activities in spreading our Krsna Consciousness movement in Tokyo. The potency of spreading Krsna Consciousness is everywhere the same. That was experimented by me in your country, where I came alone without any support; and Krsna is so kind that He has sent me so many boys and girls like you. Lord Caitanya said that every village and town on the surface of the world will know the message of the Sankirtana movement. This very statement affirms that in every village and town all over the world there are many candidates who are awaiting this message. Please therefore work very seriously. Chant your daily beads regularly. You have got a very nice devotee wife, she will help you in all respects. So try to follow the footsteps of the disciplic succession, and everything will come out successful. In London there is some clashing between the police and our men, but the reaction is in our factor. Probably there will be a great agitation in this connection, and the whole world will know automatically the importance of this movement. Gaurasundara has intended to call me at Hawaii during Lord Caitanya's birthday, somewhere by the end of March 1970. Similarly, whenever you are also nicely established, you may also call me and I shall be very glad to visit your center. By the by, I may request you that you may take quotation of our BTG for printing 100,000 (one hundred thousand) copies per month from some of the leading printers in Tokyo. I am happy to learn your plans for celebrating Lord Caitanya's appearance day, and please make the meeting very successful. Hope this will meet you in very good health. Please offer my blessings to your good wife, Cintamani, and to all the other boys and girls there. Please accept my blessings. I beg to acknowledge receipt of your letter dated 12 February, 1970, and I am very glad to know that you are doing well in Boston Temple. I did not know where you were staying and I was very much anxious about your health, so I wrote to Subala and he has conveyed my message to you. Now I am relieved to learn that your are engaged in cooking and your injury is healing nicely. I am also feeling very well here in Los Angeles. Gargamuni has rented a nice house with a sunny compound for me, and I am being attended by two good boys, Nanda Kumar and Devananda. Hope this letter will meet you again in good health, and thank you for your sincere service. Please accept my blessings. I beg to acknowledge the receipt of your very interesting letter dated 11 February, 1970. In the meantime, I have sent you one letter which I hope you have received by this time. Herewith please find one cover addressed to George Harrison, and I hope you will deliver it with my blessings. I am very glad that his service is effectively working on him, and that is the way of realization, Krsna Consciousness. The description of Krsna Consciousness movement in London gives me a great pleasure with hope and interest. Lord Caitanya was also checked in His Sankirtana movement by the then police officer, and He led a procession of one hundred thousands of men to the house of the Kazi. So I think Lord Caitanya is planning a situation which will help us in pushing the Krsna Consciousness movement throughout the whole world. I therefore request you all to chant Hare Krsna mantra very rigidly sixteen rounds a day and thus be fixed up in your spiritual strength and everything will come out successful. The cover of George Harrison is open, and after reading it you can close it and deliver it to him. 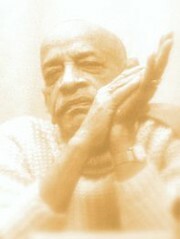 So far his contribution is concerned, I shall duly acknowledge it as I do usually in the Krsna book also. Besides that, I wish to put his good name on the dedication page of devotional service. * I would have done this in the Isopanisad, but this book was already printed. I hope you like the letter which I have addressed to George. Hope this will meet you in good health. Offer my blessings to Malati, your daughter, Sarasvati, and all other boys and girls at the Temple. Under the pressure of illusory energy, especially in the age of ``Kali,'' all the people of the world are unhappy; but I am sure if they take to this simple chanting of the Holy Name of the Lord, Hare Krsna Hare Krsna Krsna Krsna Hare Hare/Hare Rama Hare Rama Rama Rama Hare Hare under the guidance of Lord Caitanya, certainly they will be happy. I know that both you and John are very good souls. Both of you are pledged to do something for the peace of the world. By the grace of Krsna, you have already realized to some extent about the necessity and importance of Hare Krsna movement in the world. Similarly, if John also does so, it will be a great event. Please accept my blessings. I beg to acknowledge receipt of your letter dated 10 February, 1970, and I am very glad to learn that you are planning to celebrate the appearance day of Lord Caitanya with a nice ceremony and installation of the Deities at the grand opening of the New Navadvipa Temple. I will be very happy to come to Hawaii New Navadvipa for this occasion if you will make all the necessary arrangements for my passage, etc. Regarding the tax exemption from the Internal Revenue Service, I understand from Gargamuni that it is already filed and you may apply as a foreign incorporation in the state of Hawaii. I have asked him to send you all the necessary papers in this connection as well as an explanation of procedure for filing for state tax exemption. I hope this information has by now reached you and you will immediately do the needful. Hope this will meet you in good health, and please convey my blessings to Govinda dasi and all the boys and girls there. Please accept my blessings. I am very glad to receive your letter dated 1 February, 1970. Some years ago, when I was visiting your house, your father requested me to teach you Bhagavad-gita. I immediately agreed to this proposal, but later on your father changed his mind and he wanted to wait until your education would be finished. I am very glad to learn that in the month of May you will be finishing your Indian educational career and you propose to come in the States for your postgraduate education in engineering. So I welcome you and when you come here you will be at liberty to stay in any one of my preaching centers. I have got now twenty-six different centers in Europe, U.S.A., Canada, Japan, and Australia beginning from Hamburg, Germany down to Tokyo, covering about 14,000 miles. Generally I stay in Los Angeles because the climate of this city is almost like our Bengal. Regarding my help for your coming here, there are three ways. You may apply for acceptance at a university here. If you are accepted by a university, they can arrange a job for you. Then you may come here by the university's arrangement as a foreign exchange student. Second: Another way is that if I can show a bank balance in your favor to the extent of $12,000 to $15,000 and because I am an immigrant and thus I sponsor you, you can come here as immigrant immediately as my relative. Now, for this bank balance, how you will arrange? Another way is if you can spend about Rs. 25,000, you can come here at any time as a visitor at least for six months. When you come here, you can try for a suitable job in any respectable firm or whatever you like you may be free to move and search out within that period. but if you come as a visitor you will not be allowed to work here by law, but by arrangement everything may be done. So these are the three ways of getting you here, and whichever way you find suitable can be arranged. You will be glad to learn that our Sankirtana Movement in the Western world is going on very successfully. Your fathers Spiritual Teacher, Mother Anandamayee, is very much fond of Sankirtana. So I wish that your father may send us mrdanga (Khol) and karatalas for this great Sankirtana Yajna. Mother Anandamayee has got many rich followers, if some of them send us this khol and karatalas for our different centers all over the world--Europe, American, Canada, Japan, Australia then it will be a great cooperation. I hope you will ask you father to do this service for Lord Krsna or Lord Sri Caitanya Mahaprabhu Who foretold that in every city, town, and village of the world His Holy Name would be celebrated, and we are trying in our humble way to spread this message. I hope this will find you in good health, and thanking you once more for your attention. Please accept my blessings. I beg to acknowledge receipt of your letter dated 9 February, 1970, and I have also received the two tapes sent by separate mail. I have sent a few tapes to Bhagavan das. He sends to you his edited copies and they may be made final. I want two editings only, just to see if there is any grammatical or spelling mistake. Your present program of two editions first by yourself and then by Jayadvaita is a nice arrangement. Jayadvaita has good knowledge. In this connection, I may inform you that I have heard there is some difficulty for working on our press. I was talking yesterday with Gargamuni that the press will require an investment of great amount of money to keep it going on nicely, so please let me know what is the actual position. I understand there is some confusion about the press working and it is also understood that this confusion is due to my direction. I do not know what they mean by this. Yourself, Brahmananda, and Advaita are appointed as three directors of the press, and why there should be confusion on account of me? So many things daily I here from Gargamuni and he again speaks to Brahmananda, so let me know clearly what direction you want from me in writing. I have written to Hayagriva to send the manuscript, typed or untyped for being submitted to Dai Nippon immediately. If Hayagriva does not send it immediately, I think the duplicate copy which is with you may be submitted. The number of pictures to accompany the 400 pages text is 52 (fifty two) not 50 as you have written. I want that the manuscript and the pictures be submitted to Dai Nippon without delay. Yes, it certainly requires many leaders to manage the many affairs of a large scale institution, so you must train up whatever men you have got and try to manage this way. Now we are increasing, and with the increment we must make arrangement for carrying on very nicely. At the same time we should see that all the members are chanting regularly, that is our strength, and following the regulative principles strictly. Maya is very strong. If we do not keep ourselves fit by chanting Hare Krsna, we may fall a victim at any moment. Please accept my blessings. I beg to acknowledge receipt of your letter dated February 4, 1970, and I am glad to learn that you have now become steady in comparison with your flickering past life. The association of devotees is the most important element in learning Krishna Consciousness way of life. By association with undesirable companions we have learned so many bad habits and similarly by association with pure persons or devotees we can become purified of our acquired bad habits. So constant association and working cooperatively with devotees is the prime and easy method to relearn our original good habit of Krsna Consciousness. I am also very pleased to know that you are living happily with your good wife, and you are expecting a child in July. So now you must take especial care to raise the new child in such a nice way that he will become a pure devotee in Krsna Consciousness; that is the responsibility of the parents, to see that their child is freed from the clutches of Maya. It is good news that by joint agreement you are now established as a nice Krsna Consciousness family in Boston center where you are working on the press. Please do persevere and make advancement in this Krsna Consciousness movement. In this connection, I may inform you that now we are in need of devotees who are very well versed in the scriptures. The means of understanding the spirit of the scriptures is to chant regularly sixteen rounds daily without fail and follow the regulative principles rigidly. All our students must carry out these daily duties of regular chanting without offense of ten kinds, following the regulations, and studying our literatures, both in the weekly classes and individually, with close attention for thorough understanding of the transcendental subject. Regarding your first question to explain the statement of Sri Isopanisad that ``even though so many complete units emanate from Him, He remains the complete balance.'' In material things there is exhaustion and in spiritual things there is no exhaustion; that is the difference between matter and spirit. From one Krsna there were 16,100 Krsnas in Dvaraka, and each Krsna is as good as the original Krsna. Just like there may be 1000 candles, and all of them light up from one original candle, but still they are of the same candle power as the original candle. Similarly, there may be hundreds and thousands of emanations from Krsna the Supreme, but that does not mean that the Supreme One has diminished in potency, although all other emanations are equally potential. Regarding your second question, what I said at the airport was that everything is not your's. Everything is Krsna's; you are Krsna's. I hope this will clear the misunderstanding. This process of understanding by devotional service is essential for developing Krsna Consciousness and you all must follow this program assiduously. Please accept my blessings. I beg to acknowledge receipt of your two letters dated 10 and 12 February, 1970 respectively. I am glad to learn that you are early planning for the upcoming Ratha-yatra festival. In this connection, I have requested the exact date of the festival from India but it has not yet been replied, so you may plan for any suitable date between 20 and 31 July--even if it does not correspond, we have to arrange conveniently, that is allowed. So far additions for this years Rathayatra, you may make three Rathas, one for each of the Deities. The rest of the details are already there, simply you may may supply more money for festoons, decorations, flowers, bells, flags, etc. The Spiritual Sky is far away, but you just try to do it following Jagannatha Puri Rathayatra. Jagannatha Puri or wherever Rathayatra is performed is not different from the spiritual sky. In the spring you may lead a very big procession on Lord Caitanya's birthday. This is a good plan to celebrate this great spring festival out of doors. So make this a very opulent procession with large Sankirtana Party and you may also celebrate in this way again with a procession on Janmastami day. These two important subjects may be observed in this way by all the three areas and similarly in other centers also. Regarding your first question, a pure devotee is never under the modes of nature. In other words, no material laws apply on a devotee because he is fully under the direction of Krsna. So a devotee can continue his present occupation or he may change it if he likes. Krsna does not force a devotee because the devotee acts spontaneously according to the desire of the Lord; in this kind of loving service there is no question of force. Force is applied only when there is denial of Krsna. Just as the citizens of a state have freedom to follow the laws of the state, that is subordinate freedom, and the freedom of the living entities is also subordinate to Krsna. The clue is given there in the Bhagavad-gita that the living entities are fragmental parts and parcels of the Supreme Lord, this means that all the qualities of Krsna are therefore present in minute quantity in each of His parts and parcels. That is simultaneously one and different philosophy--the living entities thus have free will because they are parts of Krsna and Krsna has free will, but the free will of Krsna is Supreme while the freedom of the parts and parcels is minute. So if the living entity out of love subordinates his free will to Krsna that is his liberation. He is no longer forced to act helplessly, but he acts freely rendering loving devotional service to Krsna in every way. Then we have the practical conclusion from Krsna confirmed by Him in Bhagavad-gita (18:66), ``Just surrender unto Me; and in return I shall protect you from all sinful reactions. Therefore you have nothing to fear.'' In this way astral influences are also material and therefore they do not affect the devotee who has taken protection of Krsna's internal energy, by surrendering his life and soul in the service of the Lord. Your second question about spacemen from other planets; it is stated in the Vedic literature that there are many planets where the inhabitants are more advanced than the inhabitants of this earth planet. So it is not unlikely that such people may have developed space travelling methods. They occupy higher posts in the creation of the Lord and so they may be considered as demigods in the same way as the president is specially empowered by the nation, but this does not mean that such spacemen are necessarily carrying the messages of the Lord, just as the business of the state employee is not to act as the state representative but he acts in his particular job. Because Krsna know everyone's future does not remove our free will. Someone may commit a theft, and if I know that then I know that he will be captured and punished. That is knowing his future, but know that future does not mean that he had no choice not to commit the criminal act. There are two destinies for every one. One destiny is in Krsna Consciousness and the other destiny is in material consciousness, so if someone is in Krsna Consciousness then Krsna knows his future and if he is in material consciousness and acting in that way then Krsna also knows his future. In this way the free will is not affected by knowing the future of the living being, that is an erroneous conclusion. In regard to praying to Lord Nityananda Prabhu I have written to you in my last letter that such prayer is quite appropriate. Our only prayer should be in the matter of desiring further development of devotional service and such sincere prayer should be submitted not directly to the lord but through the via-media of His bona fide servitor or representative. I am very glad to learn that S.F. Temple is doing very nicely in the street Sankirtana with transcendental plays. And your BTG sales are very encouraging to me. I have heard from Gargamuni that you are ordering 20,000 issues of BTG and this is very good news. Selling BTG means that out movement is increasing and our philosophy is being appreciated. Uttama Sloka is a very good devotee and I am also glad to learn that he is of great assistance to you in guiding the new devotees. He may remain there with my permission for as long as he may like, I know that he is very valuable as an expert Temple manager. I have already sent Hamsaduta to oversee the Germany center and help them be organized. I am very happy to learn that you are arranging for opening another center in San Jose. From your letter I can understand that it will be a good start in spreading our Krsna Consciousness movement to the Spanish speaking people. I do not care whether the center is opened this place or that place, simply I want to see that eventually a center is opened in every place. So far now you may start the center in San Jose, and as you say that there are many advantages to this procedure, you must develop it nicely. This will be a good opportunity for Citsukhananda and his wife to engage some Spanish speaking devotees to help them when the South American center is first opened. So by the near location you should keep in close touch and give them all assistance as much as possible. Your plan is fully approved by me, and you may immediately begin your preparations without delay. I am so very happy to learn of your increasing desire to spread this Sankirtana movement. My Guru Maharaja used to say that one who has actually got life cannot do but preach this Krsna Consciousness--real spiritual life means he must preach, and he is really a preacher. Now we must prepare all our disciples for serious preaching work, so I am requesting everyone of my initiated students to very seriously chant daily sixteen rounds without fail and to strictly follow the regulative practices. If these two things are done regularly there will be no chance of falling down because these principles are the essential basis of spiritual strength. In addition to this the classes and individual study of our scriptures must be done very scrutinizingly by you all so that you can be preachers fully convinced yourselves of this transcendental science and its necessity for the mankind in general. If one simply regularly chants and follows the rules and regulative principles all questions of philosophy will be answered by Krsna from within and all doubt will be cleared also in this way. And the same answers are there again in our books like Bhagavad-gita As It Is, Srimad-Bhagavatam, etc. So please see that all the initiated devotees stick rigidly to their daily chanting and regulative living in devotional service. This is most important. Please accept my blessings. I beg to acknowledge receipt of your letter dated February 2, 1970, along with the letter from Sriman April Grover, your St. Louis newsletter, and one handbill. I may inform you that by the grace of Krsna this mission of spreading Krishna Consciousness is being enthusiastically pushed on for the benefit of the whole world by the assistance of all my disciples, good souls like your self and your good wife. I am so happy to see that you have introduced our Bhakti Yoga or Krishna Consciousness classes in two universities, St. Louis University and Washington University. This is the real course of study for human beings and we should use such good opportunities to give the young collegiate boys and girls this education of spiritual science. So please conduct these courses diligently to influence the hearts of the students and encourage them to participate in your temple's activities as well as weekly classes at the universities. I am glad to learn that your Sunday Prasadam love feast has grown to fifty persons attending and participating in our Krishna Consciousness Program, and also you are holding successful Kirtana in the high schools. These young people are our future in Krishna Consciousness so try your best to convince them of the importance of this movement. I have replied the letter from Anil Grover duly, and I hope these answers will satisfy his questions. You may further encourage him to chant regularly on beads, follow the four restrictive principles, and study our Scriptures with your help. If this chanting is sincerely performed and the regulative principles strictly followed, Krishna will give intelligence in such way to remove all doubts and answer all questions of philosophy from within the heart of the devotee. This regular program is essential. Please offer my blessings also to your wife, Indira dasi, and to the other boys and girls and devotees there. I hope this will meet you all in good health.